The woman who inherits the Fujou name is destined to lose her sight, for being unable to see the material world comes hand in hand with the ability to peer into the world of spirits. Hisui and Kohaku both came from a branch of this family. Unlike the Fujou, this branch did pass on their abilities through blood. However, Hisui and Kohaku’s mother violated a taboo and the branch fell into ruin, which led to the two children being taken in by Tohno Makihisa. 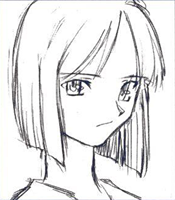 By the way, it has nothing to do with Tsukihime’s story, but the picture below is what Hisui and Kohaku’s mother looked like when she was young. ① As you can tell from the name, this is the name of a family of miko priestesses1. ② Hisui and Kohaku are from a branch of the Fujou family. ③ Women who bear the Fujou family name lose their sight, and supposedly thereby gain the ability to see another world. ^ Fujou is written with the kanji for Miko and Purity. The woman who inherits the Fujou name is destined to lose her sight, for being unable to see the material world comes hand in hand with the ability to peer into the world of spirits. Hisui and Kohaku both came from a branch of this family, and unlike the Fujou, this branch did pass on their abilities through blood. 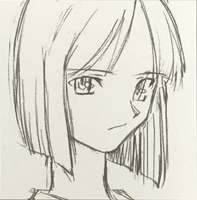 However, Hisui and Kohaku’s mother violated a taboo and the branch fell into ruin, which led to the two children being taken in by Tohno Makihisa.